Arizona Horseriding Adventures™ - Horsemanship 101 Spring Camp Ages 8 to 15 4 Day Summer SessionREGISTRATION $325 Mar. 19th - Mar. 22nd Our Camps are fun and educational givingthe attendees the opportunity to learn about horses and horsemanship.Enroll your child today! the attendees the opportunity to learn about horses and horsemanship. The Horsemanship 101 Summer Camp for Kids is an excellent introduction for interested boys and girls to have a hands-on experience in learning about horses, including the general care of horses, grooming, foot care, and safety around horses, as well as the safe handling of horses, both on the ground and while mounted. In addition, students will learn about horse care, parts of the horse and saddle, and other interesting facts about horses. Students will also get to meet our mascot Mr. Bones, who will be very instrumental in learning about horse anatomy. Camp attendees will also learn how to properly saddle the horse, mount and dismount, and safely ride at a walk, and possibly the trot, with a balanced seat. The student will learn how to effectively use the reins, along with the natural aids of the legs, seat, and voice to control the horse. There will be horse related games, while mounted and unmounted, and crafts designed to be fun and educational. 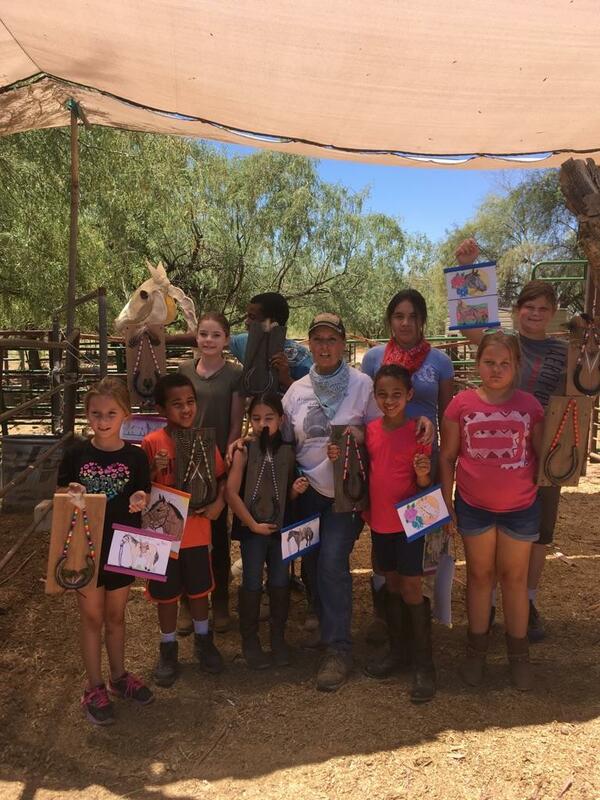 The camp attendees will get to paint the horses during one of the activities and will also participate in the ground work with the horses. The instructor, Anita Norton, a CHA certified instructor for western and english horsemanship, as well as for riders with disabilities, has been teaching riders, children, teens, and adults for more than 16 years. Sessions are limited to 8 attendees to provide each child a full experience. The horses used during the sessions are well-trained and appropriately selected horses owned by the instructor and regularly used for lessons as well as ranch work. We do not use rescue horses, donated horses or boarders' horses. Each session runs from Tuesday thru Friday 8:00am to 12 noon. Class size is limited, so please register early.